Use the Task Bar Menu to minimize, maximize, and restore an application window, as well as select one or all desktops on which it should appear. 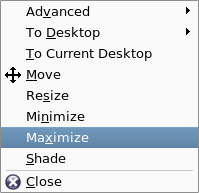 The KDE Task Bar is the portion of the KDE Panel which provides you the ability to interact with application windows even when they are not visible. You can use the Task Bar to minimize, maximize and close a running application. The Task Bar contains one button for each running user application, such as Thunderbird, Firefox, OpenOffice Writer, etc. Simply right click on the button that represents the application on which you want to perform an allowed action and a small menu pops up with your choices. Then select the action you want to perform. If you want to maximize the program window, just click on Maximize. To move the window to a different desktop, click on To Desktop and then choose the desktop number or name. In the event that a window has opened and the Title Bar is out of view above the top of the screen, you will not be able to move the window. In that case, use the Task Bar menu for that application window, select Move and the cursor will turn to a four-way arrow and you can use it to move the window without having access to the Title Bar. When the window is in the desired location, right click once and the window is dropped in that location and the cursor returns to a normal arrow. This menu is very similar to the menu you can access by clicking on the Title Bar menu icon. The difference is that this menu is always available even when the window is out of sight behind other windows or minimized.